During sunny spells over the last week or two the XCo has been slowly gaining weight on its way to becoming a functional desert bike. 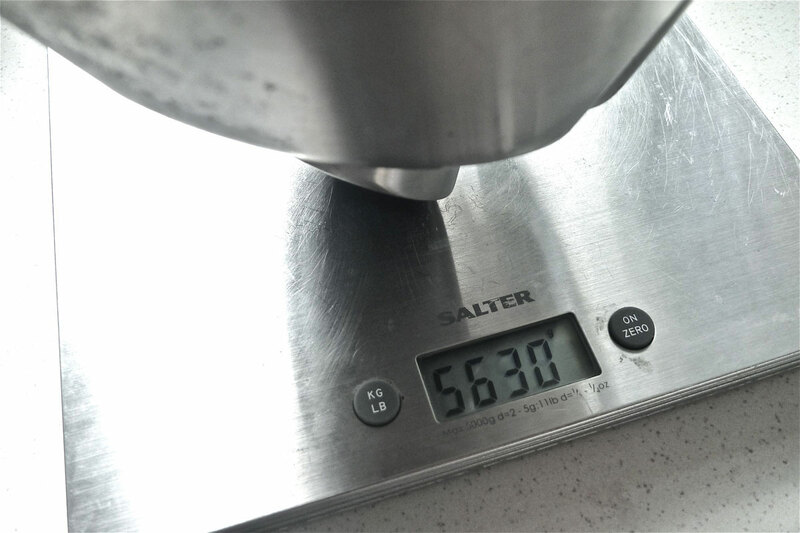 A mate running an XCh sold me his Touratech Rally bash plate (1.9kg vs 430g). Adding one of these is a no brainer although surprisingly it’s about the same size as the OE unit except of course it’s made for the job not the look. 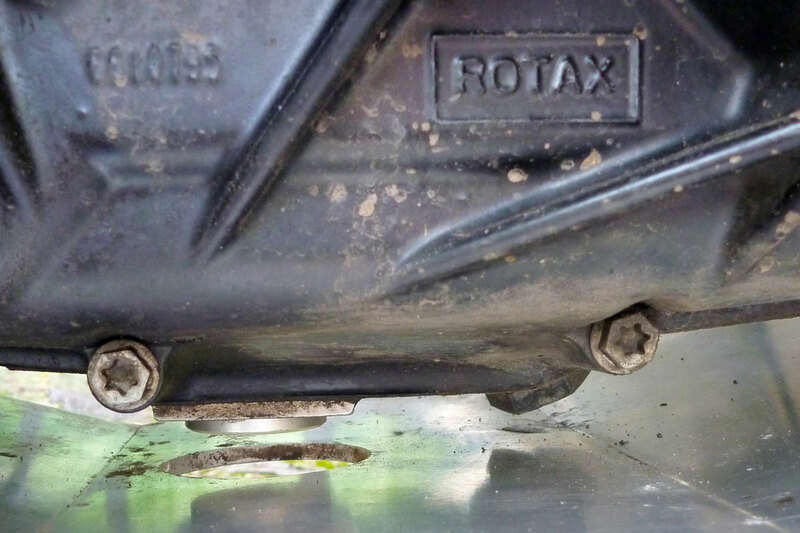 As it was, removing the original unit revealed it had already been holed, not at the drain plug (which looks like a TT low profile replacement – £27 saved, hallelujah!) but at the adjacent oil line junction which is now the lowest point (right). It looks like the used TT plate also took a hit there in a previous life. With no frame rails under the engine to rest on, the plate is unsupported between the mounts at each end which may explain how it got dinged off the oil nut. I may stuff some dense closed-cell foam in there, especially around that oil nut, to help dampen a heavy smack on the middle of the plate. 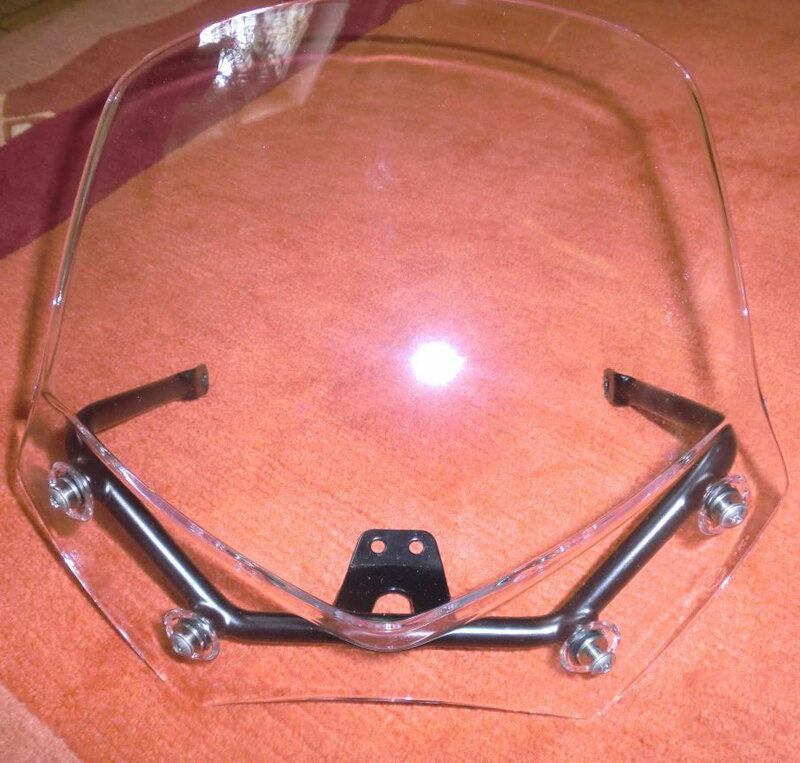 Normally I’d have made one out of plastic or rubber, but along with other stuff from Wunderlich (40% cheaper in Germany – where have you hear that before? 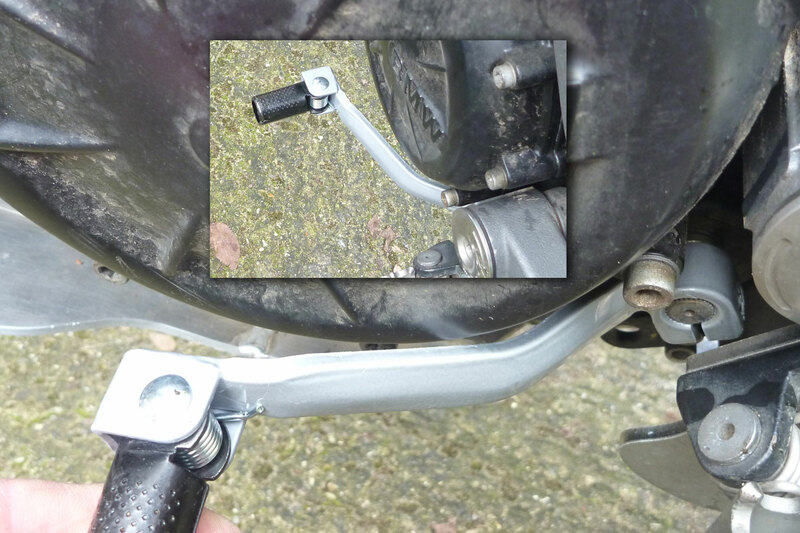 So much for the EU), I treated myself to their fender extender (left; 100g?) to stop crap clogging up the radiator. It fits on in a jiffy but needs a longer replacement bolt which Wunderlich don’t supply, although they do supply you with a 3-kilo catalog. As you can see I’ve also fitted my ‘signature’ canvas tool pouch (left; 200g?). 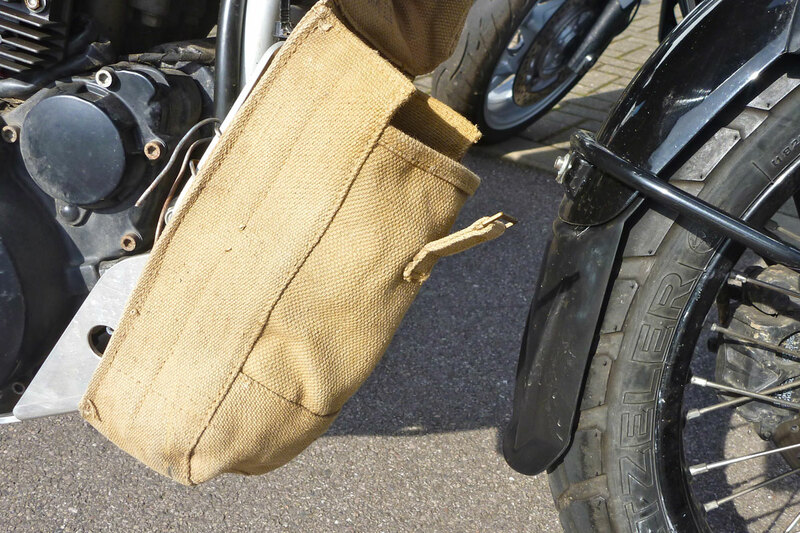 You read about adapting tractor tool tubes but I like the pouch; it’s bash proof, rugged, easy to close and takes a 1.5L water bottle, my tool roll or whatever’s needed. You’ll find them on ebay for around a fiver. Search: ’58 pattern canvas ammo pouch’. 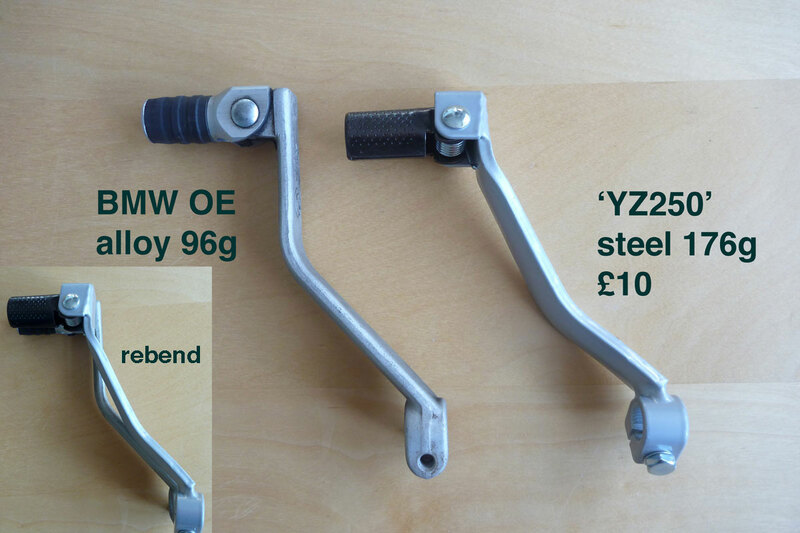 I am definitely getting old and lazy as I coughed up for a Wunderlich enlarged sidestand foot too (50g). It will be OK on soft ground but I know for sure it won’t be big enough on soft desert sand. Perhaps I’ll extend it when the need comes and anyway it saves welding permanently onto the bike. 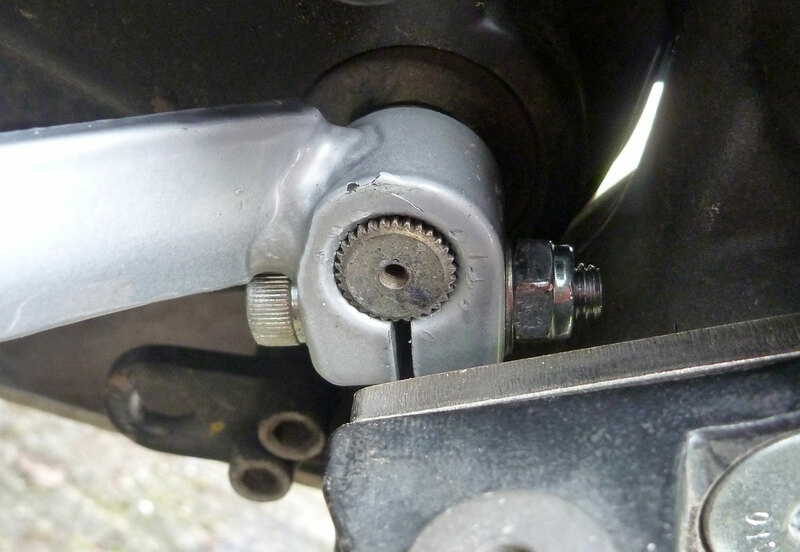 The alloy shifter on the X bikes sticks out vulnerably from the narrow engine and is said to be too rigid to the point where it can snap or damage the selector shaft. You don’t want that. They say old 650 Funduro steel ones fit or later F650 Dakar shifters, but the selection (so to speak) on ebay looked like they’ve all been over an IED and most didn’t have a folding tip which is as useful as bendy steel. New ones are £60 but on a tip I found a YZ250 cheapie from MD Racing posted for a tenner (176g vx 96g). It gets very close to the case so needs a little rebending to match the OE item which I’ll get round to with some Mole grips or a vice. I also found there’s no room to get the bolt in once on the splines, so I put a longer bolt in from other end with a nut (right). 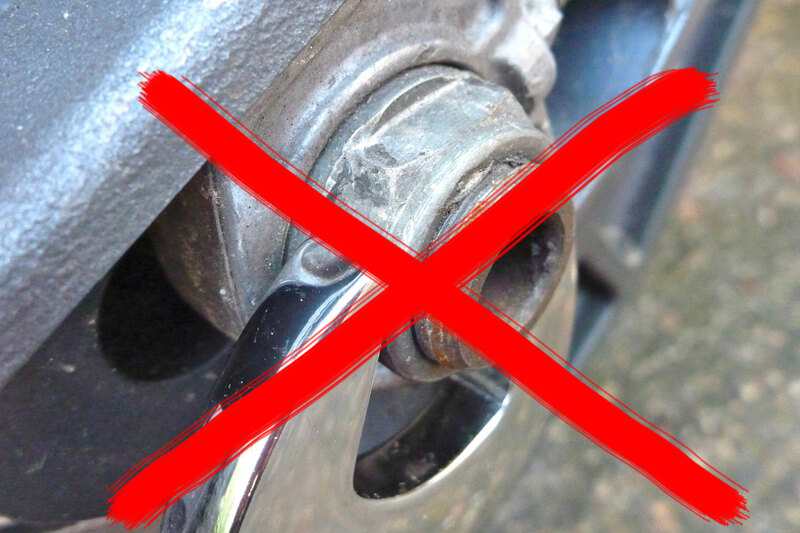 One of the less bright ideas to save weight on the X bikes was to use wheel spindle nuts with faces about 5mm wide. What chance has a commonly used nut like that got of not getting mashed? None at all I can confirm; the front one undid OK but the back nut soon turned into a fat washer and had to be chiselled until the bugger split right off the spindle. 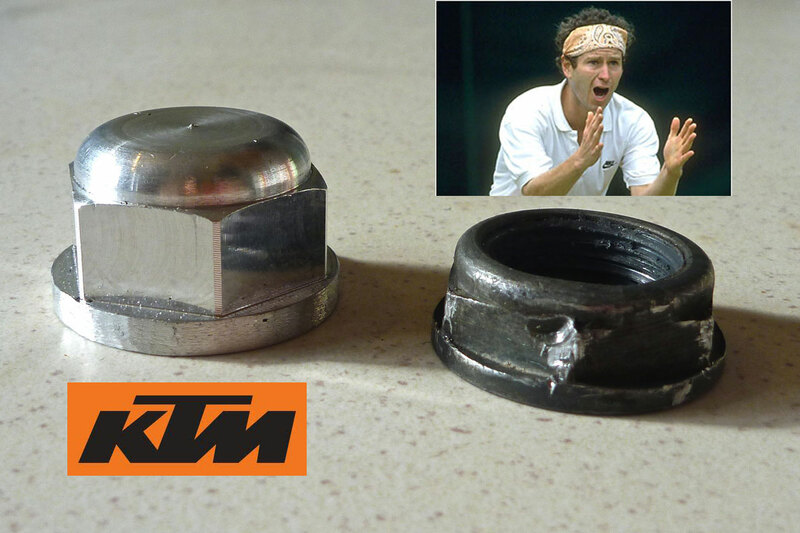 Luckily, Xbike gurus out there have found that lighter domed alloy 27mm KTM 450 nuts fit (p/n 50310099000; about £4). Sort of. Again, the front fits fine but for the back you have to trim a millimetre off the radius of the collar so it fits against the sunken chain adjuster (more details at the excellent mattsnook Xcountry resource). I don’t have access to a lathe to do a neat skim job but found that chamfering a bevel on the collar’s edge with a grinding stone on the end of a drill did the trick. Overall I’d have preferred a regular steel wheel nut – 27mm in M20 1.5mm is what you need – but gave up finding anything close to the price of new KTMs nuts so I’ve bought a third as a back up in case one gets mashed. 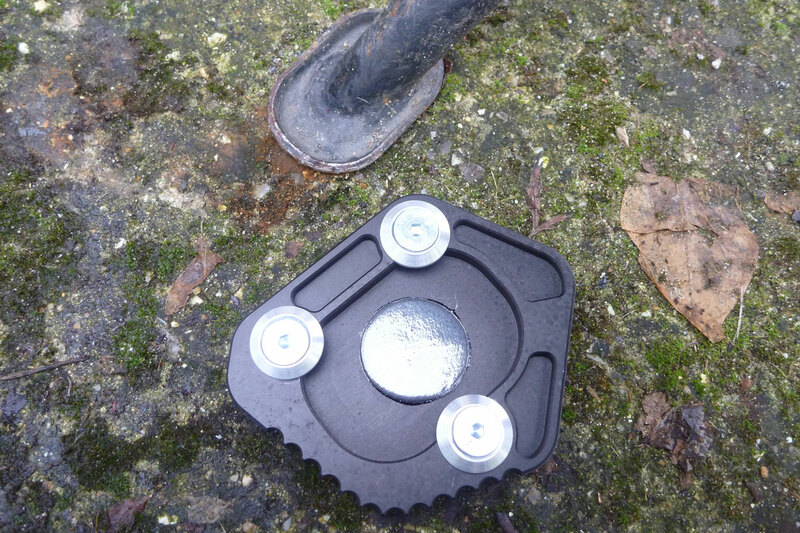 My bike was missing its BMW toolkit and guess what, a new one only costs £112 (though many other BMs share it; see link). Now I have the wheel nut size sorted at the more regular 27mm size, I started looking for one of those flat ring spanners you get with Jap bikes plus some mini pliers to add under the seat with a few spanners and hex keys. 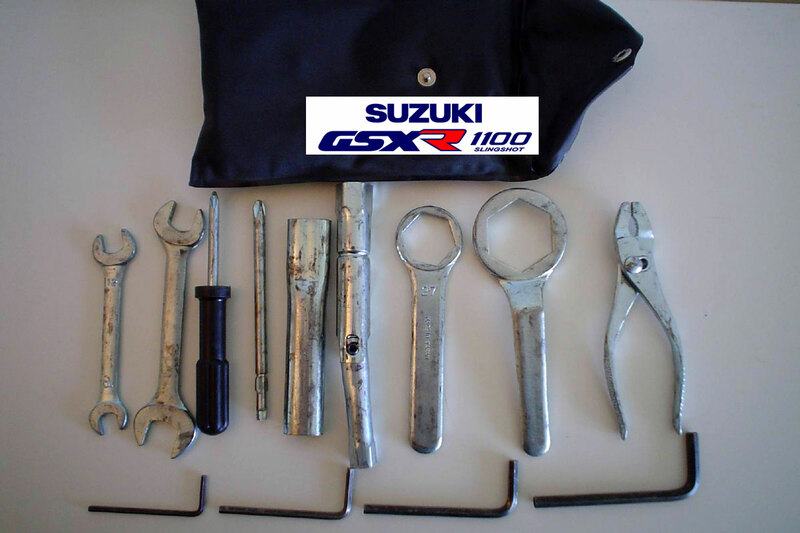 After hours on the web trying to save a fiver, the cheapest solution I found was something like a used toolkit off an early-ish GSXR1100. Plenty of them around once so plenty in the breakers. I got one as shown above for £15 posted. It comes with the vital flat ring 27mm with extension handle, pliers and all four hex keys match exactly what the BMW uses. With a 12mm for the chain tension and a combo 8/7mm ring I’ll be in business. 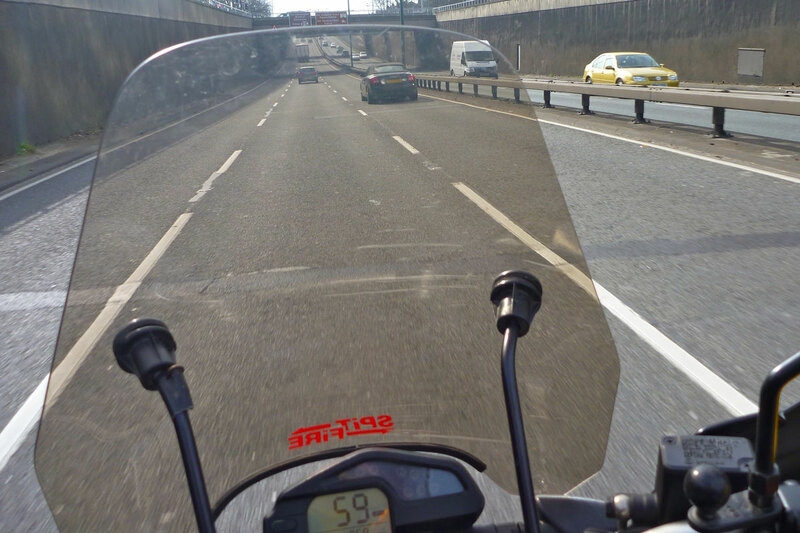 If not hex, then the 650X uses a lot of 8mm head, plus a couple of 7s and 13/15 on the mirrors where I’ve fitted some RAM ball mounts (see windscreen image below; 50g) for GPS, cameras and so on. I’m not convinced it’ll be up to it, but seeing as it’s around, I re-fitted my US-made Slipsteam Spitfire windscreen (~1kg?) off last year’s CRF-L. 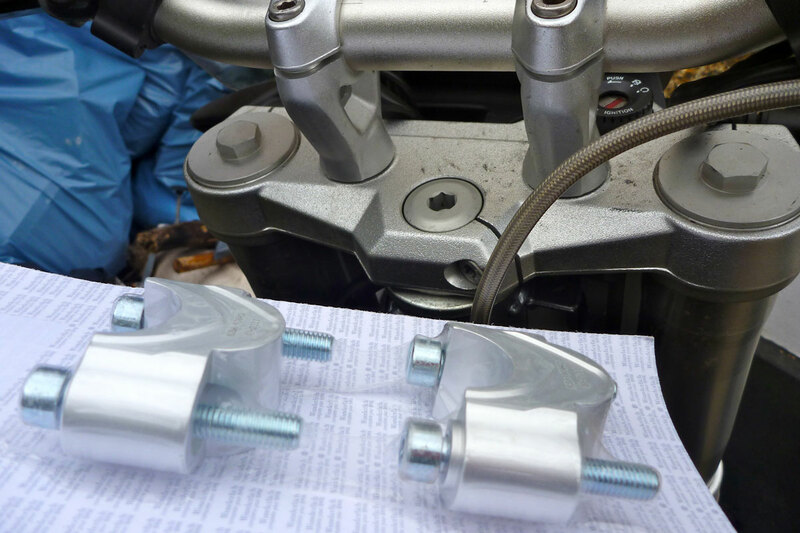 There are plenty of windscreens to be had in the UK, but for just $20 for some larger 1 1/4 inch clamps to fit the BMW’s fat 1.125 (28.5mm) bars, it was worth the gamble. On the 30-mile run down to Vines in Guildford along on the A3 to get the subframe, I fully expected it to play up, but it held firm at 70mph, despite its single pair of mounting stalks. I can’t say sitting behind it was like being in the back of a Mercedes sedan in full repose, but it must lessen the wind pressure and didn’t seem to affect the handling. That may yet prove an issue as the BM is faster the old 250 CRF. The great thing with the Spitfire is it comes off in a jiffy if heading off road. Apparently a smaller screen off a BMW R1200R (right) fits right onto an Xcountry too – the price for the screen and frame new from BMW? – don’t ask – but I picked up a used one on ebay.de for around €100 in case the Spitfire proves to be a misfire. In my Wunderlich shopping frenzy I bought some ~25mm bar risers but I’m not sure there’s an urgent need for them just yet, as I’ve found briefly standing was not too much of a stoop. Maybe one for later when the off roading begins in earnest. So all up with these adaptions I’ve spent around £300 including the spare screen and added about 3.5kg. Fitting a tail rack and increasing the woeful 9-litre fuel capacity. Fit a 12-volt power socket. Fit my ex-CRF-L Barkbusters when the fatbar clamps turn up (current ones are all-plastic cheapies). I also noted with regret that the shock is on max pre-load so at the very least I’ll probably need a heavy duty spring from Hyperpro, if not the Wilbers stick they all rave about. Looking into the huge silencer which weighs in at 5.6kg, the word seems to be that nothing else works as efficiently, despite the great noise they might make and the 2 kilos of weight they may save, so put your money into something else. It may be worth performing a catsectomy to cut out the cat converter in the silencer’s end cap. I’m told by Hot Rod Erik this only saves about 300g but it significantly reduces the heat built up (which cats need to work properly) at the front of the pipe. That may affect emissions for future roadworthy tests, but is probably a good idea for the desert if I can get hold of a bashed up X-silencer. 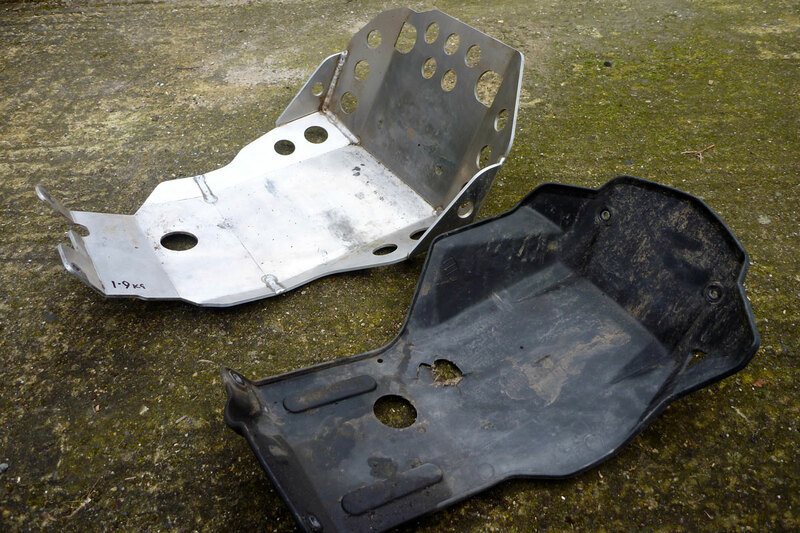 For the steel subframe swap click this. 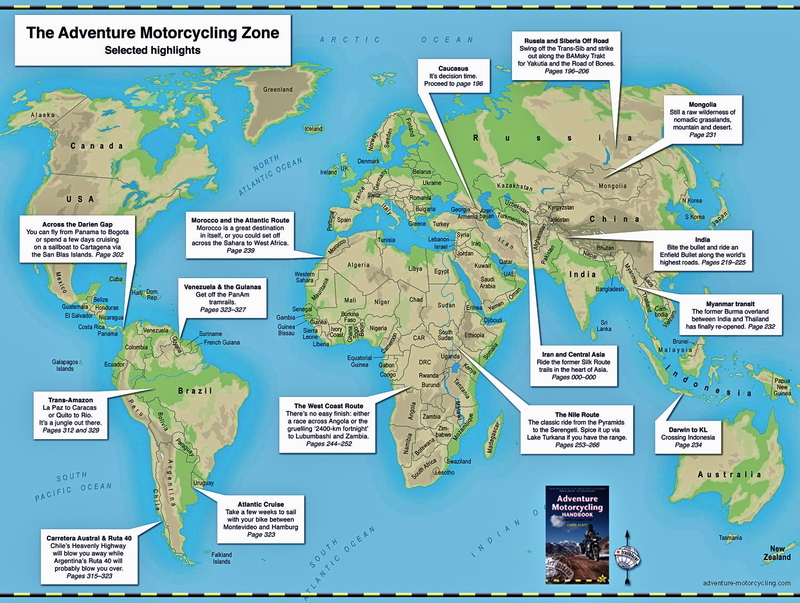 This entry was posted in AMH News, Project Bikes and tagged BMW 650X Country 27mm wheel nuts, BMW X-country bash plate, BMW X-country steel gear lever, BMW X-country windscreens, mattsnook Xcountry resource. Bookmark the permalink.